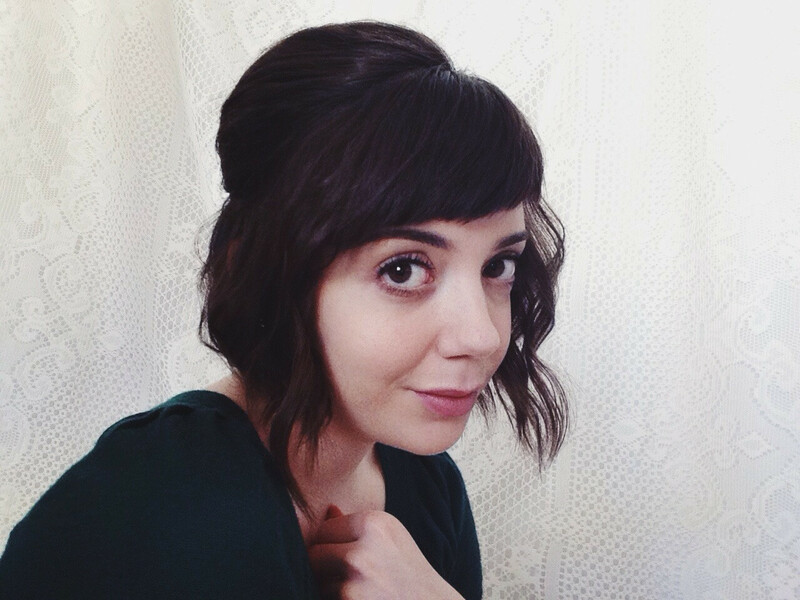 I'm back with my second of three holiday hair tutorials for short hair! I mentioned yesterday that I have been receiving a lot of requests for hairstyle tutorials lately, and because I love to get fancied up for holiday parties, I used those requests as an excuse to try out a few different looks for fun. Now I'm sharing my favorites here with you! Lucky you. I'm super excited about this one in particular, though, because it is something I've been wanting to try on myself for quite awhile but just for some reason never got around to trying it. I'm really happy with how it turned out and how it looks on me. For this next tutorial, I styled my hair into a tiny little bouffant. I finished off the look by pulling everything sleekly back behind my ears. I think this look is super sophisticated, but in a very understated way. I love that it's a bit of a faux pixie, and I really love that it feels a tad retro. See how I easily created this look below. Start by sectioning off the front portion of your hair, everything from your ears forward. This back section will be used to create the bouffant, so leave the front alone for now. You can pin it forward and down, if you like. Backcomb the back section of your hair, starting from the bottom and working your way up to the top of your head. Spray sections with hair spray as you go along. Go for maximum volume here. Your hair will likely look a bit ridiculous when done with this stage. Now that you've gotten a good amount of volume, begin smoothing the top layer of hair starting in the middle and moving to each side. If you've pinned the front, unpin it now. Make sure that the entire top layer of hair is smooth and looks seamless. To create that perfect bouffant look, let the front hang forward and grab the back section of hair (that you backcombed), pushing it up and forward a bit. Smooth everything one last time using a comb. 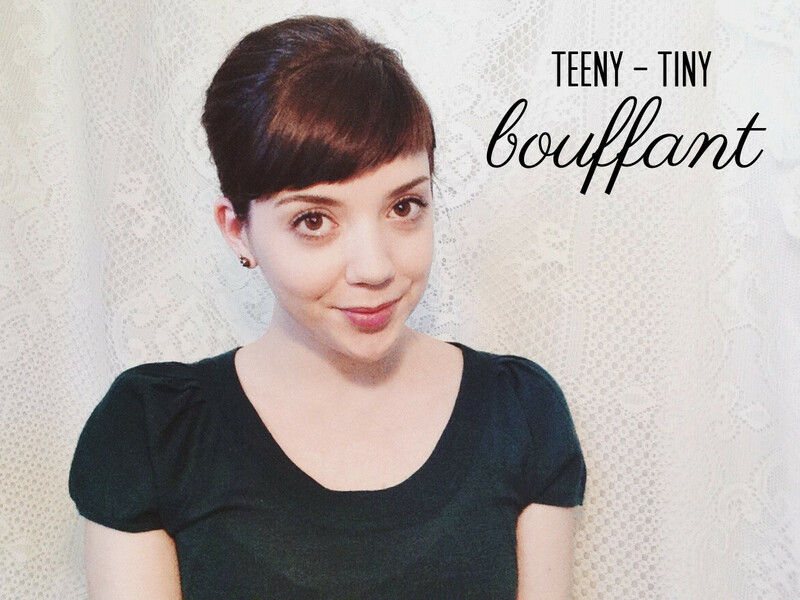 Pin the bouffant in place at the back of your head with bobby pins. Using a straightener or a curling iron, create some simple waves to the hair that is left out of the bouffant. You can leave the hair like this, if you fancy. For a sleeker look, and for a bit of a faux pixie, comb all of the hair back behind the ears. Use a bit of styling putting, to insure all the hair will stay in place, and pin the hair at the base of your head in the back. I'm excited to wear this look a few times this holiday season. I think it will look perfect finished with a thin gold headband. And maybe, perhaps, it will keep me from wanting to chop to a pixie for a little while longer (because I've been feeling rather inclined to do that lately). Stop by again tomorrow for another retro inspired look.